Boston Celtics fragrance is a must for any Boston Celtics fan! 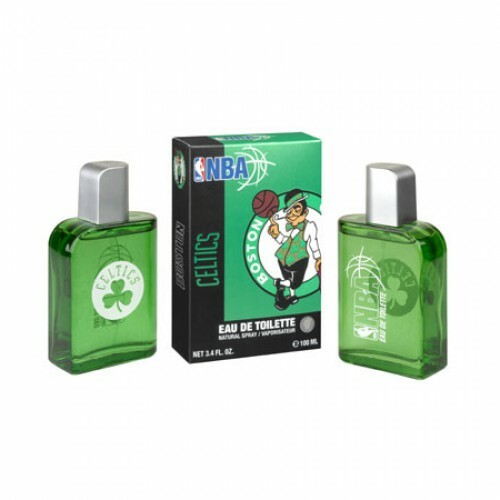 Boston Celtics Eau De Toilette 100ml. - This aromatic fragrance is highlighted with notes of spicy pepper, soft mimosa and rich oak and tobacco. Go Celtics! NBA Celtics fragrance is a must for any Boston Celtics fan! This fragrance is in celebration of the NBA National Basketball Association founded in 1946. A fragrance inspired by the world's greatest game and the Boston Celtics. This is a fresh warm masculine scent with hints of tart green apple to keep it light. The top notes are tea green apple bitter orange and aquatic spices. The heart notes are lavender cedar wood and tonka bean. And the bottom notes are musk moss and vetiver. Made in Spain. Long lasting fragrance, perfect for sports persons, recommended for daily use, ideal for basketball players. Gives extra strong performance, impressive and appealing fragrance, keeps you fresh and fragrant all day long easy to use and carry very nice masculine aroma. Boston Celtics playing for the typical male characteristics. Courage, strength, determination and desire to win. All these ingredients can be found in colored glass flacon, which is adorned with a sleek silver cap and motives of the popular American games. The box, which protects against damage this perfume is also brought out in the spirit of basketball. Get news of the Boston Celtics and drift pleasant fragrance energetic adrenaline and joy of movement. A refreshing blend of fruit and flowers commences with the aroma of juicy apples, which mixes tones beneficial tea, cool water and optimistic chords oranges. After the initial dose of freshness comes the elegant and sensual interplay of flowers and precious wood. Unique tonka bean, together with a unique dry lavender and cedar passing game senses. A nice finishing touch is performed earthy moss, vetiver and seductive musk. Eau de Toilette Boston Celtics has medium endurance.